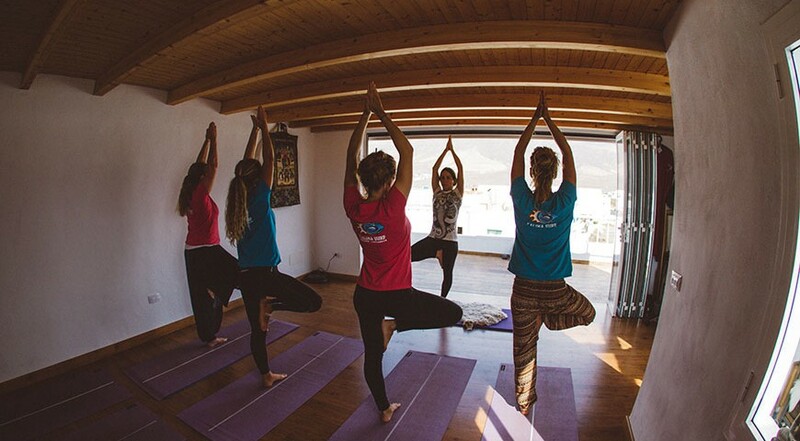 Our Surf and Yoga Holidays in Famara, Lanzarote provide a perfect escape from the stresses and strains of modern life. This unique vacation combines the exhilaration of surfing with the relaxation of yoga – all set in a breathtaking, unspoilt location. Forget ideas of large groups of people in the local sports centre, or impractical locations such as on the beach, as your yoga instruction takes place in the privacy and comfort of our instructors yoga studio (which just happens to have stunning ocean views!). Yoga without a doubt complements surfing and can greatly enhance your performance in the water. As a result our yoga sessions have been specifically designed with surfing in mind which will help you revitalise and re-energise after a hard days surf! The yoga sessions combine both Hatha & Ashtanga techniques and the sessions can be tailored to the individual or small groups needs. On the Hatha side of things we tend to focus on relaxation, breathing work and gentle movement to help stretch the body and to release tension that built up in the bones, joints and muscles and on the Ashtanga side of things which is more physical we can work on different postures and breathing to help improve strength and stamina with relaxation at the end. Prices start from as little as 25€ for a private 1 hour session. Please contact the team and we will endeavor to put together a surf and yoga holidays package to suit your individual needs and budget. Our Lanzarote surf courses and camps are ideal for any level of surfer who wants intensive coaching at the highest level available in Europe. We also offer the widest choice of handpicked surf houses accommodation in Famara within easy walking distance of the beach and reef breaks. The surf school is a Oneill Surf Academy and only employs qualified instructors with Surf Life Saving Awards. WHY BOOK THIS SURFING HOLIDAY WITH ZOCO? Simple! We are the only surf travel company who offers a wide choice of hand picked private accommodation in this area to suit most tastes and budgets. Our self catering properties include: Budget studio apartments, village apartments, detached beachfront bungalows and luxury villas with private pools. We also have a knowledgeable team on the ground with over 20 years experience in these islands. So whatever your needs please contact the ZOCO team for a tailor-made holiday and quotation. -Informative brochure about the island. Please note that the prices below are not seasonal and remain the same all year round. Every Extra Yoga Day must be charge 25€ per day extra. Our Surf Clinics in Lanzarote run all year round for all levels of surfers from newbies to pros. For experienced surfers we recommend the months October to April.